CAIRO DRIVE will exhaust you. It will make you glad for the chaos that is New York City driving. 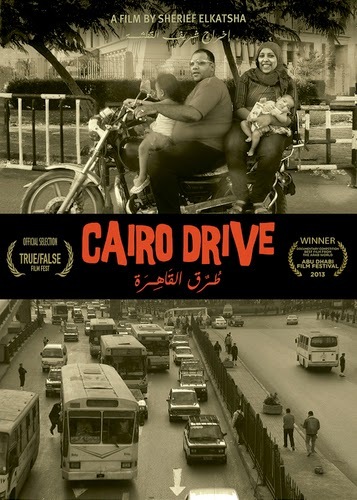 The film is an examination of Cairo and the traffic problem from the ground level. We are in the cars with the drivers and on the streets with the pedestrians. We watch the cars and motorbikes go whizzing around with seeming the greatest of ease. Its like some grand dance. 2- Pedestrians have to improvise and hope for the best since there are no crosswalks. Its a terrifying thing to watch from a theater seat, I can only imagine what it's like from the streets. The whole thing is so ridiculous that director Sherief Elkatsha includes a stand up comic in the proceedings. Unfortunately it's not always funny. We see the car crashes and we learn of the dangers to pedestrians via heartbreaking tales. With all of the chaos in the streets its a wonder that more people aren't killed on a regular basis. One of the must see films at DOCNYC. A must see because you have to see this film big so the traffic images can make you jump and wince and really react. What a wonderfully cool film. The film plays Saturday the 15th at 2PM for more details and tickets go here.